What is Meant by a 100,000 Clean Room? Home » Blog » What is Meant by a 100,000 Clean Room? A clean room is a controlled environment having low levels of pollutants like chemical vapours, aerosol particles, and airborne microbes. The 100,000 indicates the number of particles per cubic meter. Typical city environment air contains 35,000,000 particles per cubic meter. Other environment parameters that are controlled in clean rooms are pressure, humidity, and temperature. HEPA (High-Efficiency Particulate Air) filters are used to trap particles as small as 0.3 microns. All clean room air passes through the filters. When stringent cleanliness performance is required, ULPA (Ultra Low Particulate Air) filters are used. Personnel who work in clean rooms are trained in contamination control theory. Entry and exit of the clean room is through airlocks, air showers, and gowning rooms. Select clothing designed to trap contaminates naturally generated by the body and skin is worn. NextDayScience Cryogenic Vials are manufactured in classification 100,000 clean rooms. The designation means the environment has no more than a 100,000 concentration of particulates per cubic meter. Remember, the typical city environment has 35,000,000 particulates per cubic meter. 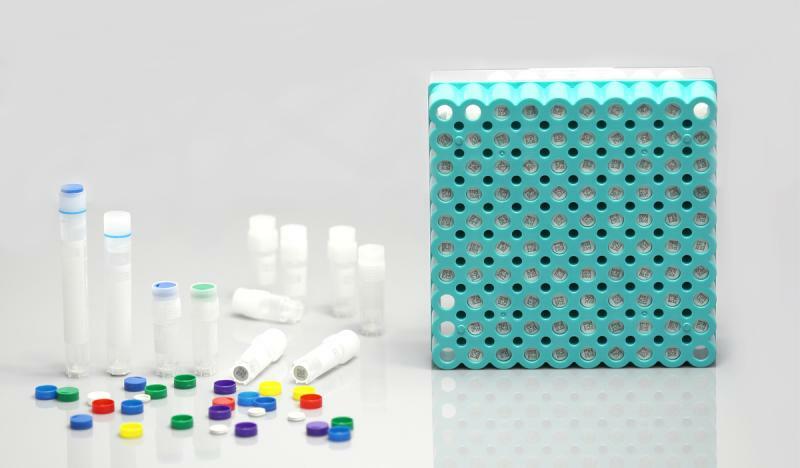 Each Non-Pyrogenic Cryovial is DNase/RNase free. They come in sterile, resealable bags. The Series 6000I and the standard cryogenic vials are used for storing liquid nitrogen in its gas phase. When dealing with substances other than the liquid phase of nitrogen, CryoCLEAR vials with internal or external threads are used.